Please log in to mySea to follow the links! In Prvić Luka there are significantly more berths. Visitors can either moor at the large jetty with mooring lines or at one of the 12 buoys in the harbour basin. 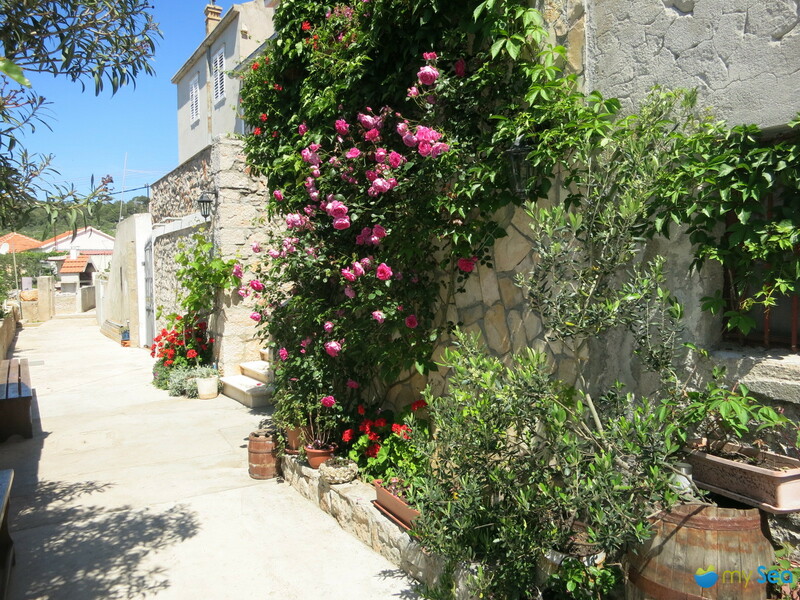 The oldest village on the island with its lovingly restored stone cottages stretches along the protected bay. 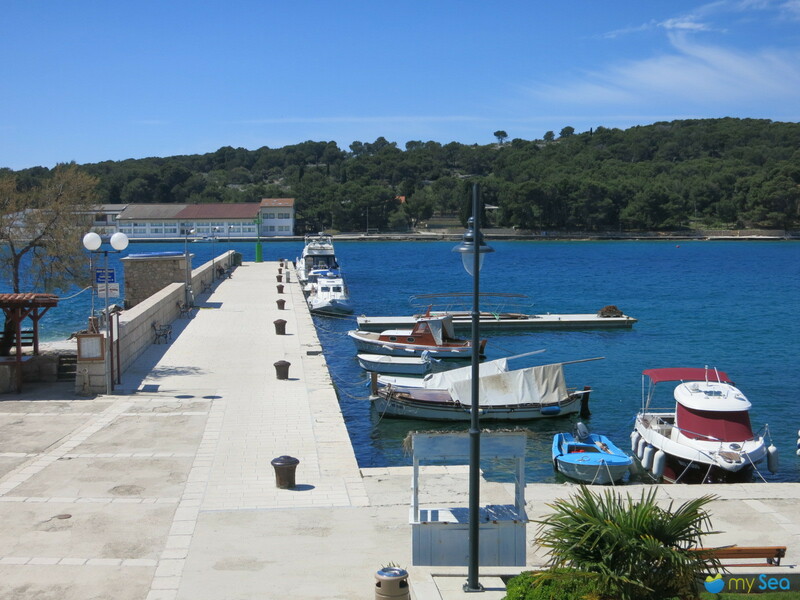 A memorial centre at the harbour jetty was opened in 2014, commemorating the island’s most famous son, Faust Vrančić, a scientist and discoverer. There are numerous restaurants right on the waterfront, attracting visitors with their fresh fish and home-made wine, accompanied by lapping waves. Prvić is the ideal place to relax. However, we cannot stay, as even though it is difficult to tear ourselves away, we still have to go to Zlarin. The island village of the same name lies in the north of the island. For centuries the locals in Zlarin fished for sponges and corals, but that is now history. Today, the approx. 150 inhabitants live on fishing, winegrowing and tourism. Sprawling palm trees decorate the promenade, green lime-washed window shutters adorn the facades of the well-kept stone cottages. And a few restaurants in between serve their dishes and drinks. 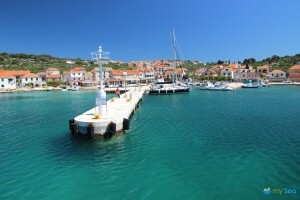 The harbour is a fishing harbour, ferry port and yacht harbour in one. Yachts moor on the north side of the long jetty. Electricity, water and mooring lines are included. A NW wind generates a strong swell, causing our yacht to rock all night long. Fortunately, at the Aldura konoba right behind the jetty they not only serve good food and delicious draught beer, but also a good strong espresso. So, now invigorated, we set off to our next destination. But before we can head for Kaprije, we want to make a short trip to the island of Tijat. Tijašćica bay is located in the south of the island, has clear water and is surrounded by green pine forests. 18 buoys have been available here since 2012. There is a small rotisserie at the northern seafront that only opens in summer. Should you need an after-dinner walk, you can hike on the mountain, which is 120 m high and has a summit cross. Visitors can enjoy a glorious view from up here of the surrounding islands. We plane towards the north-east coast of Kaprije to Medos bay. The bright turquoise clear water is noticeable already at the approach. The seabed can be seen clearly even where the water is 10 m deep. Yachts moor at a small floating jetty with mooring lines. Should the 6-8 berths be taken, there are still 4 buoys available. All of the berths belong to the Kunjka konoba, which opened in 2011. The small konoba is low-key, but fits into the landscape perfectly. They not only serve fresh fish and barbecued steaks, but Lammpeka also comes highly recommended, however it has to be ordered at least two hours in advance because of the long cooking time. 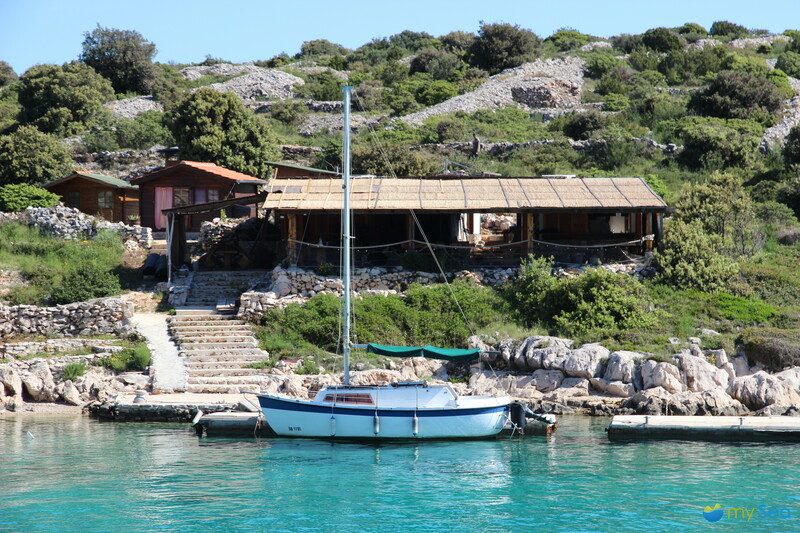 Further to the south, hidden behind the small island of Oštrica, is the Antonio konoba. Antonio Junaković runs this small konoba with a guesthouse. The speciality here is the Peka made with lamb, octopus or calamari. Fans of fine-dining will get their money’s worth in Nozdra bay in the south of the island. Matteo has established itself here. 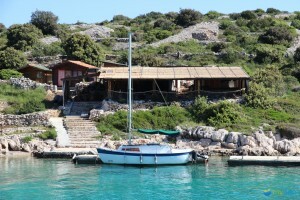 The landlord Mate Obratov had already made a good name in the Kornati before he came to Kaprije. The restaurant is built into the slope and extremely sleek. Not only can guests enjoy the tuna carpaccio speciality, but naturally there are fresh fish and meat dishes, too. The jetty provides berths for 10-14 yachts. Because of the shallow water, boats moor bow-to. Right next to Matteo is G8. Not quite so well-known but more homely and just as good. 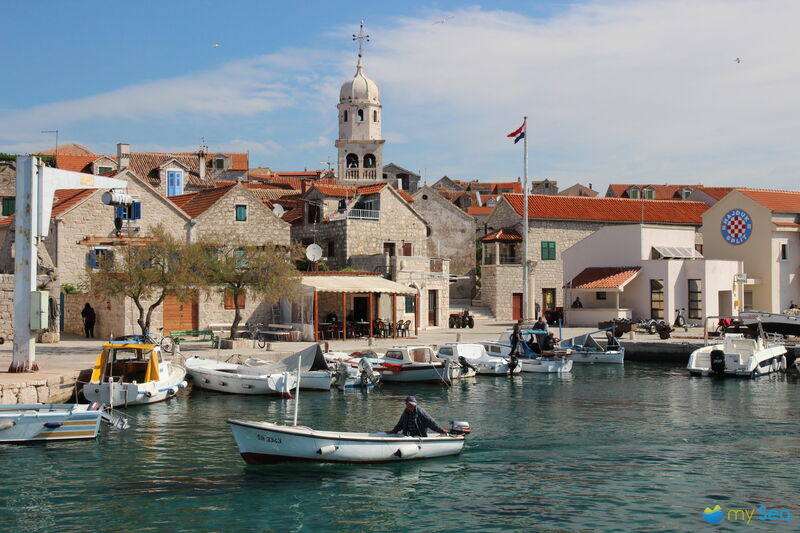 We sail around the southern tip of Kaprije and set off towards Kakan, or more precisely Potkučina bay. We are impressed by the colour intensity of the water right at the approach, perfecting the impression of a perfect lagoon. The Borovnjak islands off the coast provide shelter from waves. There are 60 buoys in total in the bay. The “Babalu” rotisserie is nestled in the mountain’s crest between green pine trees and bushes. Not only will guests be served good food here, they can also enjoy a glorious view of the bay. The concession holder of the buoys is also the owner of Paradiso in Tratica bay. Zoran, the boss of the Paradiso konoba, could have even just stepped out of a Robinson Crusoe film, his hair being so white and wild. The white beard and the white hair have long become his trademark. Together with his wife he mainly serves fresh fish and seafood. They also have meat dishes. The tables at the konoba are under pine trees. A small jetty also belongs to the konoba with berths for 3-4 yachts. Sailing yachts, however, have to keep some distance between each other because of their draughts. 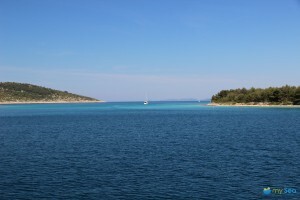 The distances between each island in the Šibenik archipelago are very short. 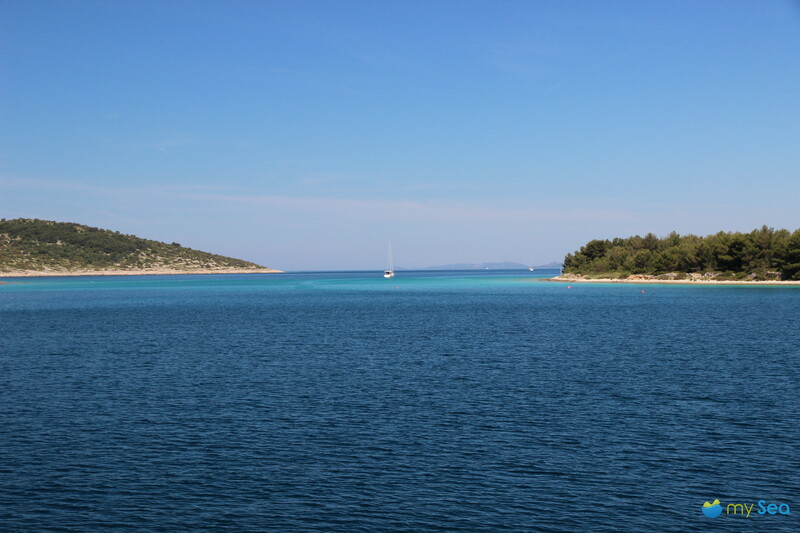 There is only 1.2 nm between Tratica bay in Kakan and Kaprije harbour in the island of the same name. 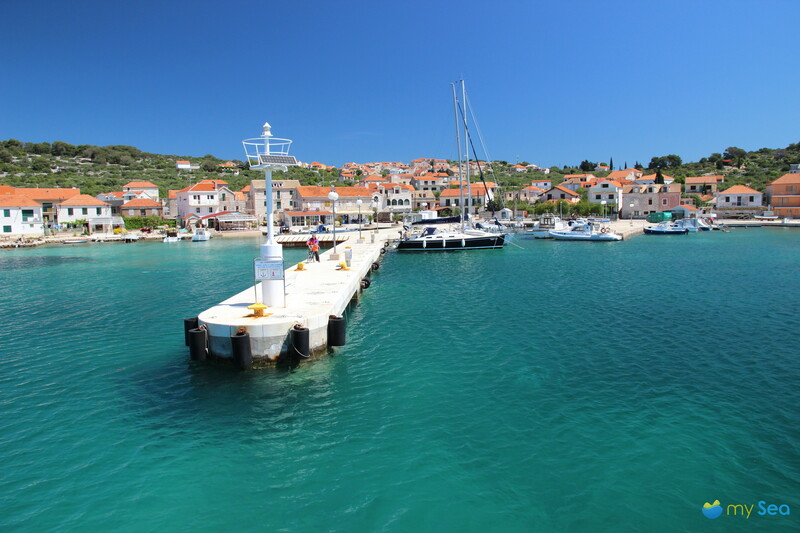 Kaprije harbour actually consists of one long jetty with places for about 20 yachts. The northern side has to be kept clear for ferries. Yachts moor on the southern side with mooring lines. Water and electricity is available. There are 24 buoys to the south of the jetty for visitors. The older part of the village with its stone cottages is located slightly higher up, a few newer houses are clustered around the harbour basin. In spring, oleander blossoms in front of practically every house, and vegetables, figs and grapes grow in the immaculate gardens. We go inside the Kot Kate konoba, slightly above the harbour. Kate runs the cosy konoba in a small side street together with her son. We meet two policija officers there whose speedboat we had already spotted in the harbour. They tell us that a military exercise will be taking place in the next 24 hours just off Žirje and that the entire maritime area to the west and south-west of Žirje is closed. Annoying as that is exactly where we wanted to go next. So we decided we would first order some fresh gilthead seabream at Kate’s konoba served with vegetables from the garden. Simply delicious! Kate´s son is a fisherman and a fireman. Meanwhile, he has rang “Ante”, a friend in Žirje. Ante is also a fireman, born in Žirje and knows the island like the back of his hand. He offers to take us across the island in his old off-road vehicle and to show us everything. A local tour guide! We willingly accept his offer, obviously. Before we leave, we drink some more of Kate’s home-made schnapps. They really do work small miracles in moderation. Have you already read part 1? And don’t forget part 3! Find out more on mySea. Everyone’s heard of Kvarner, the Kornati, Krka! But what about Potkučina, Prvić or Zirje? If you were to ask a skipper about their preferred destinations in the Adriatic coast, the Šibenik archipelago will hardly get a mention, and if it does, then at the most as a stopover on the way to Skradin. 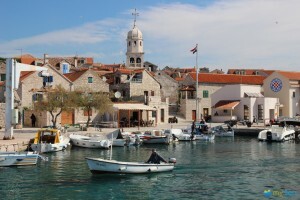 Most charter guests also prefer to start somewhere between Zadar and Murter or Trogir and Split. 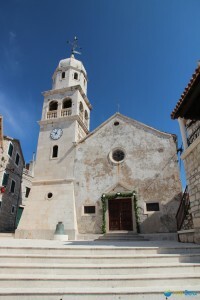 Even though Šibenik is centrally located in between the international airports of Split (about 60 km) and Zadar (about 75 km) and the motorway exit is only a few kilometres away from the harbour and marina, Šibenik was never able to establish itself as a tourist destination unlike its popular neighbours. But why is that? Is bad marketing to blame or a lack of infrastructure or less attractive destinations? It’s true that Mandalina Marina is the only marina and the harbours also have expansion potential. Equally true is that the islands are abundant in beautiful bays and sheltered anchorages. Nature lovers, discoverers and keen swimmers will get their money’s worth here, too. 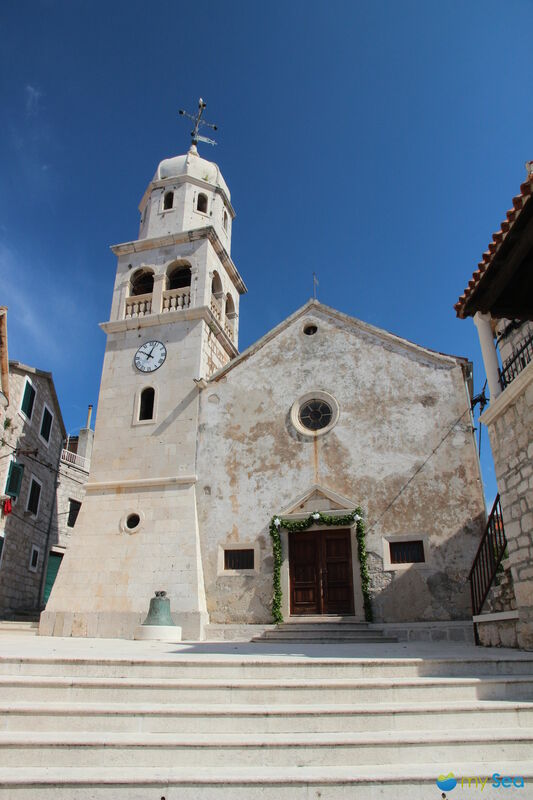 Šibenik with its 43,000 inhabitants is more urban than other places on the Adriatic coast. The reason for this is not least because Šibenik never had to push tourism like other places that mainly live from tourism. This town on the river Krka still has an intact industry today and many people work in the energy sector. They simply aren’t dependent on tourism as much as the well-known towns and villages nearby. So it’s hardly surprising that you will see less tourists in Šibenik than e.g. in the neighbouring town of Vodice, which is more developed for tourism. There is not much for visitors to see, only industrial plants and harbour installations, apart from when they arrive and depart. Then they get to see especially the magnificent buildings built during the old Austrian empire, the Venetian fortifications, palaces, churches as well as cafés and restaurants in historic buildings. People who are interested in culture but while holidaying still do not want to miss out on any urban dynamism, they should visit Šibenik, also a UNESCO World Heritage site. And not only as a quick side trip. We set sail at the beginning of May with a professional skipper from Šibenik to explore the archipelago. We wanted to discover harbours, bays and anchorages in the archipelago. Of course, we also wanted to explore the culinary side. We start at the D-Marin Mandalina in Šibenik with Prvić as our destination. The entrance to St. Anthony’s Channel has red and green markings on both sides and is completely hassle-free even in the dark. Signalling equipment has been installed for ships weighing at least 50 tonnes. We pass quickly through the channel, which is between 150 and 220 m wide, in spite of the speed limit of 10 knots. The cliffs on the south side protrude slightly more steeply but are just as green as the cliffs on the opposite side. At the western end of the channel there is a small anchorage and an imposing fortress in front of it. At St. Nicholas fortress, dating from the 15 th century, visitors can moor at a small jetty. However, there is only space here for one single yacht. And the swell generated by the incoming and outgoing ships is quite significant. But we want to keep going. The engines of our Phantom 40 push powerfully through the glassy ocean towards the north-west to Prvić. It is the closest island to the mainland and a worthwhile destination. 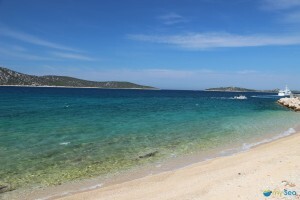 Both places on the island – Šepurine in the north-west and Prvić Luka in the south – are a clear contrast to touristy Vodice or urban Šibenik. It is a lot quieter and more relaxed here. The 500 inhabitants are mainly among themselves now in the pre-season. Only a few yachts manage to find their way here. We first call at Prvić Šepurine, the main town on the island. Šepurine is a quiet place, off the beaten mass tourist track. The church of St. Mary of the Assumption towers over the village and its 400 inhabitants, many pretty stone cottages are clustered around the harbour. Now in May, many locals are still busy getting ready for the new season. The final touches are being done on the facades, fishermen are painting their boats and the konoba terraces are being prepared with seats. Even thought the May sun in a cloudless sky is already radiating heat, proclaiming the approaching start of the season, it is not hectic. Not even Maria, the owner of the Bare konoba. She is pruning the small olive trees in front of the entrance to the konoba. And she tells us that it is very difficult in the season to get one of the few berths at the harbour. From June to September the berths are usually taken by noon. Not totally selflessly she adds that sometimes it is possible to reserve a berth at her place. This, of course, also includes a visit to the konoba. The mySea team was travelling on a Phantom 40 von NCP and Mare yacht charter. NCP and Mare is member of Euminia, the review system for charter yachts. Euminia displays yacht charter reviews from real boaters. Don’t miss parts 2 & 3 of this article!